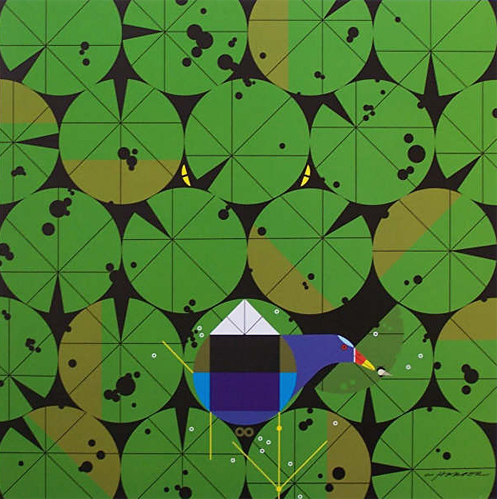 This miracle of design is “Gallinule and Gator” by the inimitable Charley Harper. Beautiful, isn’t it? Since we’re smack in the middle of the Core Team birthday season, Sara had the print framed as a gift for both of us. I didn’t even see it coming, which is rare around here but makes the gift all the more memorable. One of my favorite people gives me a print of one of my favorite birds by one of my favorite graphic artists… that’s my kind of birthday! Happy B-day!!!! Beth gave me a Charley Harper Yellow-bellied Sapsucker that is hanging on our wall now for Xmas. We have some good women. Charley Harper’s artwork was featured in one of the most recent Audubuons (or was it Nat Geo?). Anyway, lots of great bird drawings in that issue. Happy Birthday and good birding to you! Wish I was just coming up to 40! Many happys Mike. Happy Birthday, Mike. It’s not that bad on the other side. Happy Birthday! The 40s are good, no worries! Happy birthday, Mike. I’m poised on the precipice myself! Thanks all. I hadn’t realized how… mature so many of you are! Yes, 40 is only three months away for me. Receiving a Charley Harper print would make it all better. I have always loved his work and he will never be replaced. Not to mention that this piece of art was a primary feature of my IATB #21 layout!